Iridomyrmex rufoniger ( DOLICHODERINAE ). Black Wattle ( Acacia leiocalyx, MIMOSACEAE ). Scrub Boonaree ( Heterodendrum diversifolium, SAPINDACEAE ). 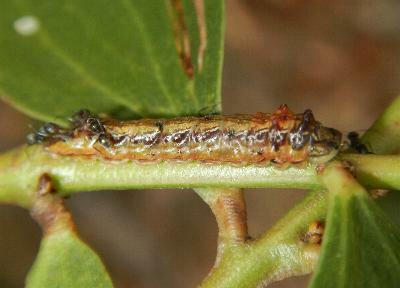 It pupates under a leaf of the food plant, the pupa being initially green with brown markings, and later brown. 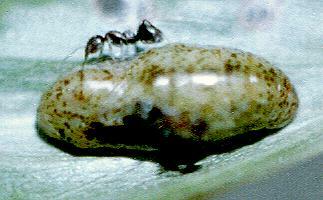 The pupa also attracts the same ants. The pupa also had a length of about 1 cm. 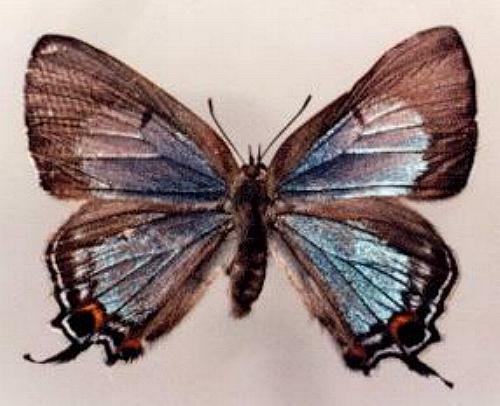 The adult has metallic blue wing upper surfaces, with two eye-spots by a little tail on each hind wing, and a short black bar on each forewing. The under-surface has a pattern of fawn and brown, and also has a pair of eye-spots by the tail on each hind wing. 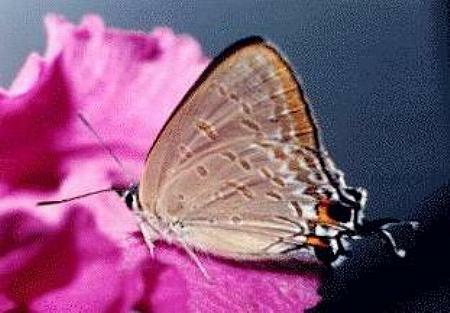 The butterfly has a wingspan of about 2 cms. The eggs are laid in small clusters on a branch of a young plant. The eggs are white round and flattened, with a diameter of about 0.6 mm. Butterflies of Australia, CSIRO Publishing, Melbourne 2000, vol. 2, pp. 723-724. Volume 5, Heft 14 (1879) p. 166, No. 92.